I have considered myself to be a fine art photographer for a few years, mainly based upon the fact that many of my photographs have evolved and developed gradually over time into artistic and quite painterly images, as I began to experiment with the use of texture overlays and multiple layers in Photoshop. This technique currently forms the basis for all of my work, although I expect it to change in the future, as I enjoy trying different techniques and have no wish to become stuck in a photographic rut. Seeing is a huge part of the photographic experience but expressing that vision is also very important to me, and I believe that there are many ways of doing this. As I learn more about Photoshop I realise how much potential there is for processing photographs in different ways and how I can utilise the programme to bring my ideas to life. Having said this I always try to get the initial photograph right in camera, especially when it comes to exposure and composition. One of the things that I love so much about taking photographs is firstly spotting my subject matter and then deciding how to frame it within my camera’s viewfinder. It might sound daft but this part of the whole process is immensely enjoyable for me, and I am always so absorbed when I am taking photographs that I am barely aware of anything else, yet the post-production work that follows is equally pleasurable. I’ve heard some photographers say that they cannot bear the computer-work element of digital photography and they will spend as little time on it as possible, making the minimum number of tweaks and adjustments, but I love it as much as the actual picture taking – I regard myself to be quite fortunate in that respect! As a photographer I am very attracted to the details, the smaller parts of a whole picture, sometimes insignificant and overlooked elements and also things that others might find less savoury – dirt, decay, dead things and dereliction, which seem to have a strange pull on my attention. I have a tendency to incorporate all of these into my work quite frequently. Over time I have collected quite an extensive database of my own photographs that I use as overlays, which includes subjects such as skies, fabric, old wallpaper, cracked and peeling paint, postcards, documents of varying types to name but a few, and I will use these as a separate layer over my base photograph in Photoshop. 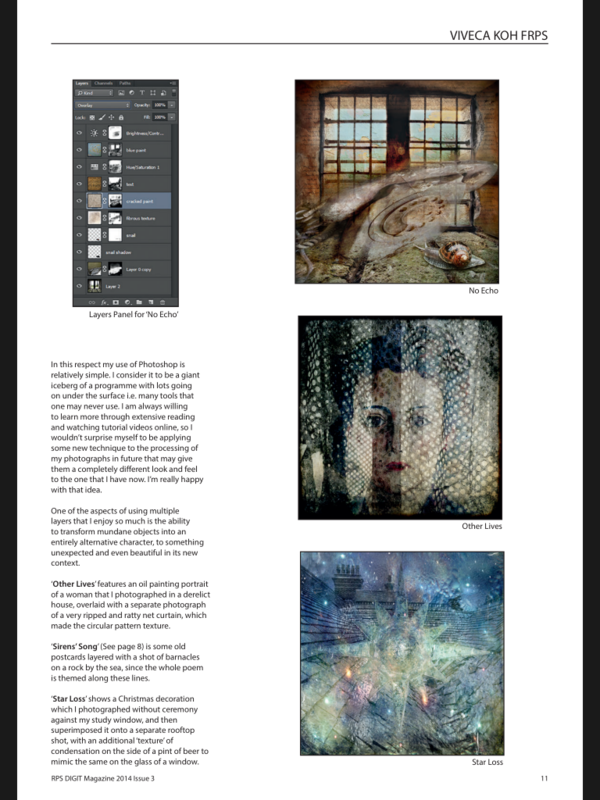 Some of my layered images are relatively simple, containing no more than half a dozen layers, others can be more complex, but all generally feature the use of layer masks which is the method I use for the fine blending of one layer with another. I had been perfecting this combination of ideas and techniques for a few months when my uncle commissioned me to illustrate in a book his latest collection of poetry and prose, after he saw one of the books I had previously created and self-published via Blurb. This book ‘Star Blossom’ was to become the basis of my Fellowship panel although I didn’t immediately realise this, and it was only when I had produced a number of illustrations for the book that I thought they might be of the right standard. 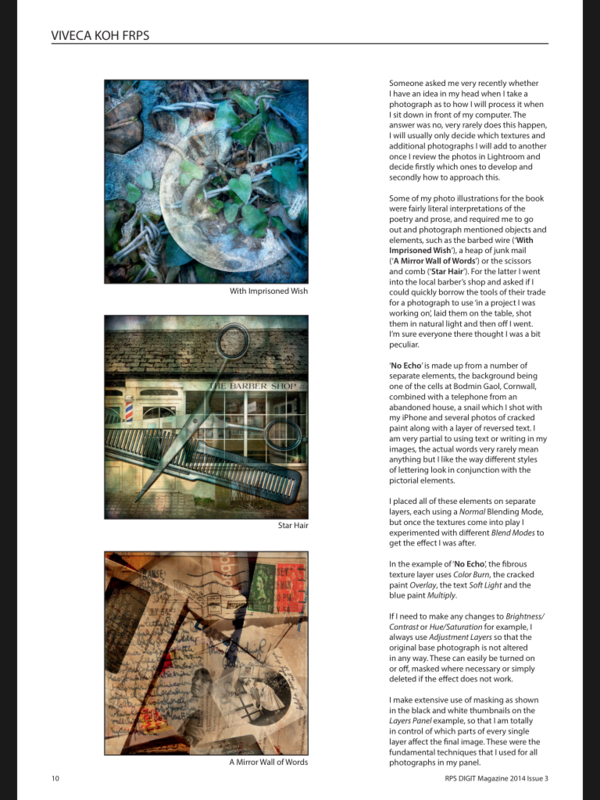 From a personal perspective I felt that they were sufficiently different from my Associateship submission (gained in June 2011) but more importantly much further evolved in demonstrating my vision and creative development as a photographer. Someone asked me very recently whether I have an idea in my head when I take a photograph as to how I will process it when I sit down in front of my computer. The answer was no, very rarely does this happen, I will usually only decide which textures and additional photographs I will add to another once I review the photos in Lightroom and decide firstly which ones to develop and secondly how to approach this. 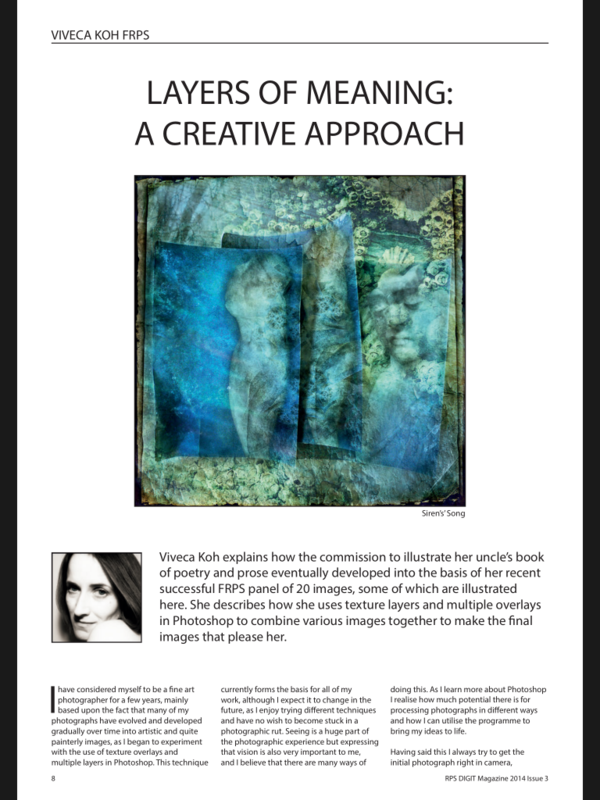 Some of my photo illustrations for the book were fairly literal interpretations of the poetry and prose, and required me to go out and photograph mentioned objects and elements, such as the barbed wire (‘With Imprisoned Wish’), a heap of junk mail (‘A Mirror Wall of Words’) or the scissors and comb (‘Star Hair’). For the latter I went into the local barber’s shop and asked if I could quickly borrow the tools of their trade for a photograph to use ‘in a project I was working on’, laid them on the table, shot them in natural light and then off I went. I’m sure everyone there thought I was a bit peculiar. ‘No Echo’ is made up from a number of separate elements, the background being one of the cells at Bodmin Gaol, Cornwall, combined with a telephone from an abandoned house, a snail which I shot with my iPhone and several photos of cracked paint along with a layer of reversed text. I am very partial to using text or writing in my images, the actual words very rarely mean anything but I like the way different styles of lettering look in conjunction with the pictorial elements. I placed all of these elements on separate layers, each using a Normal Blending Mode, but once the textures come into play I experimented with different Blend Modes to get the effect I was after. In the example of ‘No Echo’, the fibrous texture layer uses Color Burn, the cracked paint Overlay, the text Soft Light and the blue paint Multiply. If I need to make any changes to Brightness/Contrast or Hue/Saturation for example, I always use Adjustment Layers so that the original base photograph is not altered in any way. These can easily be turned on or off, masked where necessary or simply deleted if the effect does not work. I make extensive use of masking as shown in the black and white thumbnails on the Layers Panel example, so that I am totally in control of which parts of every single layer affect the final image. These were the fundamental techniques that I used for all photographs in my panel. In this respect my use of Photoshop is relatively simple. I consider it to be a giant iceberg of a programme with lots going on under the surface i.e. many tools that one may never use. I am always willing to learn more through extensive reading and watching tutorial videos online, so I wouldn’t surprise myself to be applying some new technique to the processing of my photographs in future that may give them a completely different look and feel to the one that I have now. I’m really happy with that idea. One of the aspects of using multiple layers that I enjoy so much is the ability to transform mundane objects into an entirely alternative character, to something unexpected and even beautiful in its new context. 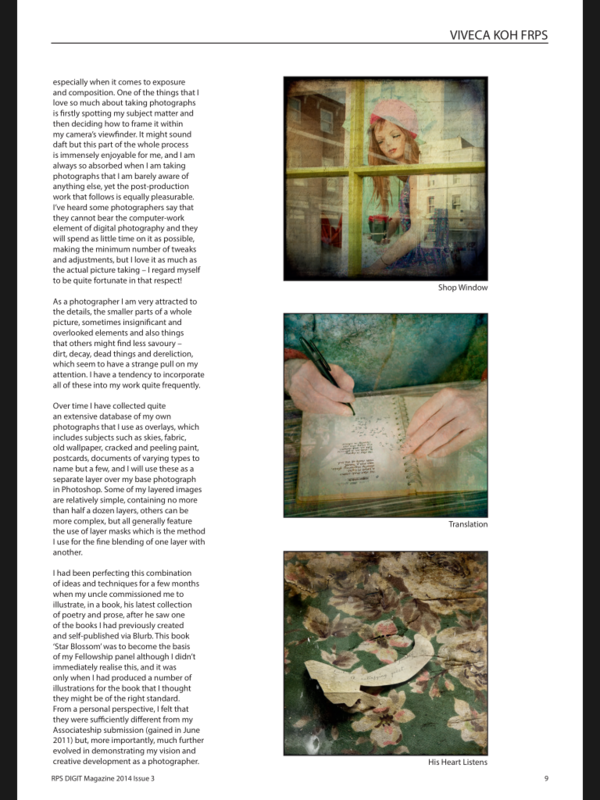 ‘Other Lives’ features an oil painting portrait of a woman that I photographed in a derelict house, overlaid with a separate photograph of a very ripped and ratty net curtain which made the circular pattern texture. ‘Sirens’ Song’ is some old postcards layered with a shot of barnacles on a rock by the sea, since the whole poem is themed along these lines. ‘Star Loss’ shows a Christmas decoration which I photographed without ceremony against my study window, and then superimposed it onto a separate rooftop shot, with an additional ‘texture’ of condensation on the side of a pint of beer to mimic the same on the glass of a window. The sparkling bokeh texture in ‘The Princess’ came from my fibre-optic lamp that I photographed quite close up with an aperture of f2.8 so that much of it was out of focus. It gives me a huge amount of satisfaction to ‘art up’ the dull, dreary and unloved in this way. 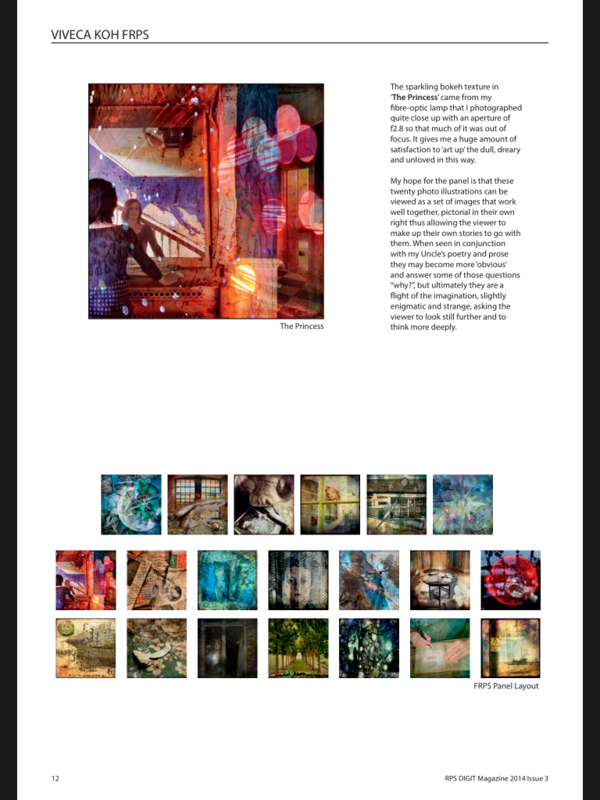 My hope for the panel is that these twenty photo illustrations can be viewed as a set of images that work well together, pictorial in their own right thus allowing the viewer to make up their own stories to go with them. When seen in conjunction with my Uncle’s poetry and prose they may become more ‘obvious’ and answer some of those questions “why?”, but ultimately they are a flight of the imagination, slightly enigmatic and strange, asking the viewer to look still further and to think more deeply. This entry was posted on Tuesday, August 19th, 2014 at 19:27. It is filed under Photography, Published Work and tagged with article, DIGIT, distinction, Fellowship, FRPS, panel, published, RPS, The Royal Photographic Society. You can follow any responses to this entry through the RSS 2.0 feed.